Full set of sails for regattas. Bronze mast and deck fittings for running rigging. Teak pin racks, with bronze belaying pins, abaft the mast. Full set of covers for deck furniture, and cap rail. Combination of Pitch, and Oregon pine planking. These are fastened to laminated Iroko main frames, using all copper fasteners. Again, laminated Iroko is used for the deck beams, with a teak deck, laid on a teak covering board. Chainplates now in stainless steel to better distribute rig and keel loads. Deck furniture restrored as per original plans. All fittings either teak or bronze, again as original. Bronze mushroom vents, and bronze electric windlass. B&G Hydra 3000, and Lowrance GlobalMap navigation electronics. She also has an engine - driven bilge pump, operating from a PTO from the main engine. This beautiful vessel was conceived by UK designer, Charles Livingstone, in the late 1890's. Aside from other design achievements, Livingstone was also on the UK Americas' Cup committee of the day. She was built by Bond of Birkenhead, and finished in 1898. She was engine-less for her first 20 years, and then had a small unit installed in 1920. Originally rigged as a gaff cutter, she was altered in 1936 to be rigged as a ketch. There passed some time with sporadic use, the odd trip from the Solway to Northern Ireland, and some training sails with the Sea Scouts, before a period of being used as a houseboat in the late 1960's. She remained based in the Oban area, until the current owner found her in 2003. At this time, she still had a ketch rig. She was transported to Mallorca, and restored to her original rig, and splendor, and has been cruised and raced as a family boat ever since. The family are now moving further afield, hence the fact that she on the market. 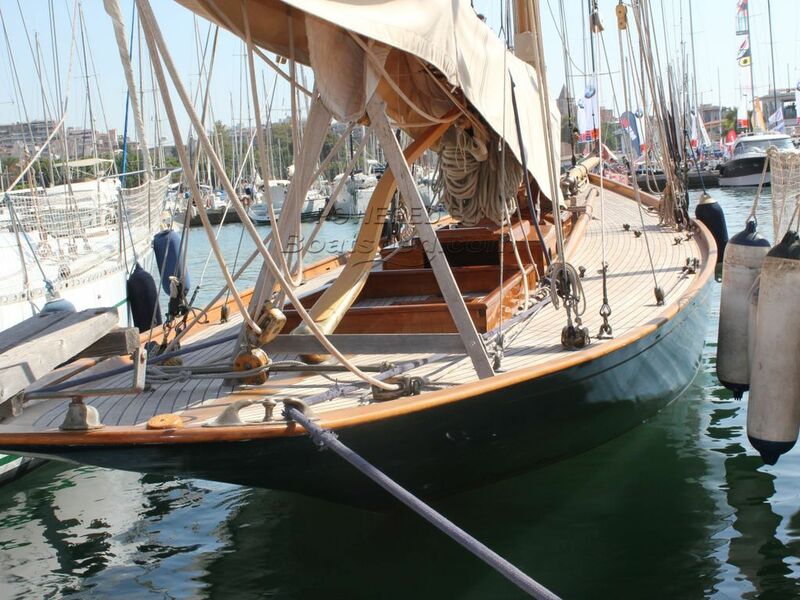 This Gaff Rigged Cutter has been personally photographed and viewed by Rory Gillard of Boatshed Palma. Click here for contact details.